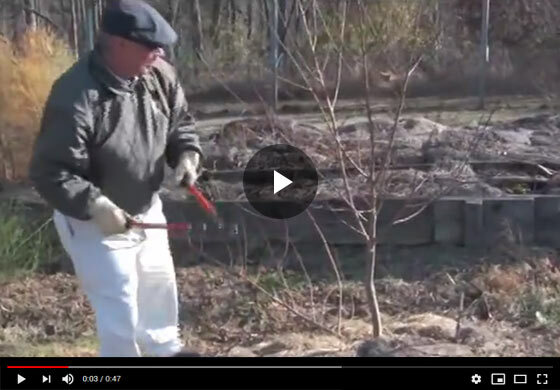 Gurney's horticulture expert demonstrates the basics of pruning trees as he walks you through the process of pruning a young two year old peach tree. Learn of the tools required, simplified technique and the benefits of pruning your trees the right way. What we're doing today is we're going to demonstrate simplified pruning. We're looking at a two year old peach tree that has not been pruned at all and we will walk around so you can get a good view of limb angles the number of limbs and a general form of the tree. We're going to use loppers and hand pruners, that's all the tools you'll need. The first cut we'll make, remove this major here, it's too low, like so, the second cut for the same reason, it's too low and, I'll take this one out here because it's on top of this limb right here. What we're trying to obtain is maximum sunlight reception to the foliage throughout the season. Other than a minor amount of detail pruning, which I'll do right now, that's all that tree will need. And all I'm going to do is just open up the middle. This allows for more sunlight penetration throughout the tree which facilitates rapid drying off in the early morning that reduces disease. That's about it from this tree this year.